With the hiring of a new head of school in 2012, The Hill School (founded in 1851) wanted to develop a vision for its campus over the next ten to fifteen years that would allow it to remain competitive with other boarding schools. We conducted extensive programming interviews with faculty and staff, and studied twenty-five different buildings, open spaces, athletic fields, pedestrian and vehicular traffic patterns on the site. Over eight months we met with the Master Plan committee to determine what facilities functioned well, what renovations were needed and what new facilities would be needed to transform the campus. Spirited, engaged, and thoughtful discussions followed the presentations of our site plan and floor plan studies at each meeting. The Planning Committee achieved broad consensus on a bold and transformative Master Plan. It includes recommendations for five new building projects, included a STEAM center, fitness center, new dormitories, and an aquatics center, as well as renovations and re-purposing of several key classroom buildings and dormitories. 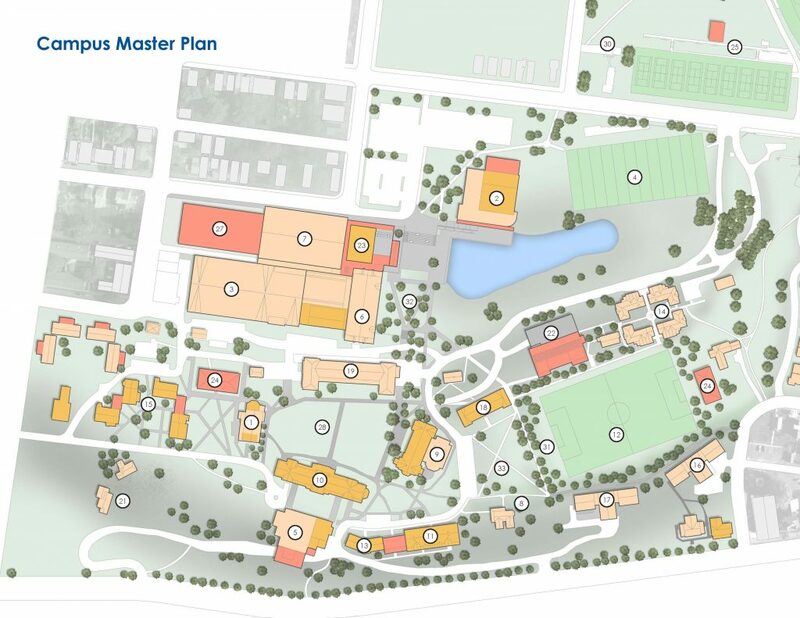 The Campus Master Plan also included a carefully re-visioned site plan with more open green spaces, less pavement, reconfigured vehicular routes, and more well-defined pedestrian walkways.